The main aim of the DREaM project is to develop a formal UK-wide network of Library and Information Science (LIS) researchers and – as such – we have been bringing together the UK LIS research community at our events. We also recognise that the involvement of international participants in DREaM events provides excellent opportunities for UK LIS researchers to strengthen their links with colleagues from beyond the UK. 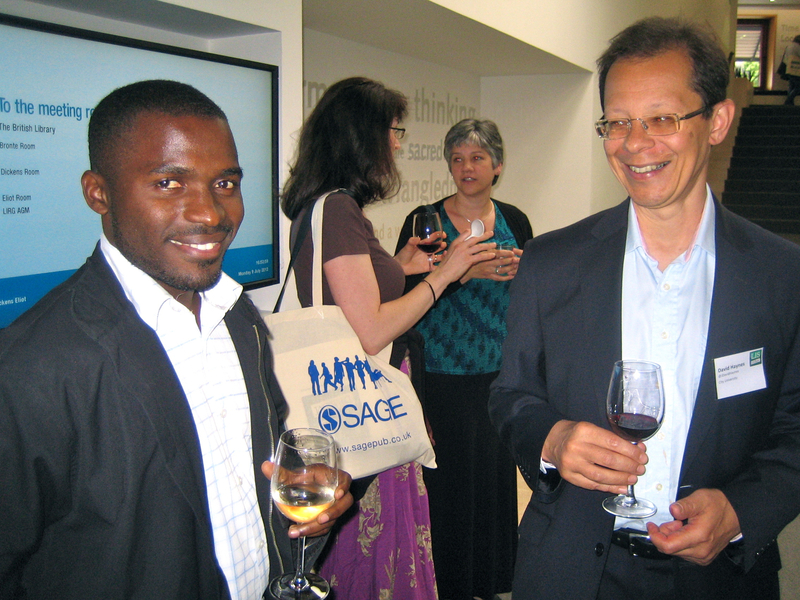 We were therefore pleased to welcome delegates and speaker from abroad to the launch conference in July 2011, and to the workshop series. In addition, a number of contributors to the programme of events are based outside the UK: Professor Blaise Cronin, Dr Thomas Haigh and Professor Carol Tenopir from the US, Professor Gunilla Widén from Finland, and Dr Dylan Evans from the Republic of Ireland. We are pleased to offer a travel bursary to the value of £100 to one of our international delegates at the DREaM project’s concluding conference at the British Library, London on Monday 9th July 2012. All interested in LIS research from countries beyond the UK – whether they be our close neighbours in the Republic of Ireland, or based at the other side of the world – are eligible to apply for the bursary. The value of the award is £100 to help with travel costs to the UK. The winner will be expected to source funding from elsewhere to cover additional expenses such as the balance on travel, plus subsistence and accommodation costs, as well as the £95 conference registration fee. The deadline for applications is Wednesday 30th May. Applications will be judged by members of the DREaM project advisory board, and the names of the winner announced by mid-June. To apply for the international delegate bursary please tick the box for “international delegate” when you register for the conference and we will be pleased to send you an application form. Registrations are now open for the 2012 DREaM project conference which takes place at the British Library Conference Centre, London on Monday 9th July. The exciting programme includes a keynote speech from best-selling author, broadcaster, medical doctor and academic Dr Ben Goldacre. Dr Goldacre will also present the Library and Information Science (LIS) Practitioner Researcher Excellence Award. Other sessions include a review of the DREaM project by Professor Hazel Hall; an opening keynote presentation on the value and impact of library and information services by Professor Carol Tenopir; a series of short delegate-led “one minute madness” presentations; an invited paper that analyses the DREaM network by Dr Louise Cooke; and an open panel discussion on how a UK network of LIS researchers can be sustained. Panellists include Dr Carla Basili of the Consiglio Nazionale delle Ricerche (Italy), CILIP’s Annie Mauger and DREaM cadre member Jo Alcock. To book your place, please register here. Registration costs £95 inclusive. There are ten bursaries of up to £90 to help new professionals and full-time PhD students who are located outside London with their travel costs. These will be awarded on a first come first served basis. So if you joined the profession in 2008 or more recently, or are a registered doctoral student, please register quickly to secure a bursary place. To see the full programme for the day, please see the DREaM conference web page. The award will be presented by best-selling author, broadcaster, medical doctor and academic Dr Ben Goldacre at the DREaM project conference at the British Library Conference Centre on 9th July 2012 to either (a) an individual librarian or information scientist, or (b) a team that has made a substantial contribution to LIS research since 2009. The indvidual or team should be based in the UK or the Republic of Ireland. The award winner(s) will receive £500 and a plaque. Immediately after the award ceremony Dr Ben Goldacre will deliver the closing keynote speech of the conference. Early in summer 2011 the DREaM project team was approached by Hulya Ceren Anil, a Masters student at the University of Surrey. Hulya asked if it would be possible for her to use the DREaM project launch conference as a site for data collection for her Masters dissertation. We were pleased both to welcome her on the day, and to hear recently that she achieved a distinction for her project, as well as her degree overall. Hulya has sent us an update on her study, the details of which are outlined below. The aim of Hulya’s research was to explore the need for interactivity in the content design of meetings and conferences. She was interested in the Generation Y perspective, and to compare this to the needs of the previous generations. She wanted to find out what kind of advanced interactive technologies may be needed in conferences and meetings in order to motivate and attract the Generation Y audience. She suspected that members of this group are less responsive to basic PowerPoint presentations. Thus she hoped to find out whether there was potential at conferences for advanced audiovisual technology such as virtual reality, 3D, hologram projections etc. The DREaM launch conference was an ideal site for data collection because of the delegate demographic in terms of age, and because the delegates were from a profession that has a tradition of conference participation. Apart from these main factors, the length and the date of the conference were ideally suited to the timing of Hulya’s research, and the venue was within easy reach for her to attend in person. Hulya was grateful for a very warm welcome from the organisers when she arrived at the British Library mid-afternoon on July 19th. The audience had been notified of her research in the conference opening session in the morning and the delegates shown her picture. Participation in the research was optional. When Hulya arrived she placed her questionnaires and envelopes near the exit of the auditorium so anyone interested could pick up a copy at the end of the conference. During closing remarks the audience was reminded about the questionnaire. After the conference Hulya also appreciated help with distributing her questionnaires to a wider audience. She followed advice from the DREaM launch conference organising committee members on how to achieve this. This help was invaluable in generating further interest in the study, and in securing a high response rate to the survey. The research findings highlight that visuals should be used extensively in meetings and conferences in order to aid the learning process of Generation Y delegates, and to keep them focused. To do this, an appropriate combination of these should be used along with other forms of data presentation such as audio, motion pictures (videos), and texts. The main reason for the necessity of high visual content is that Generation Y has been exposed to images and visual learning since early childhood. This generation is used to playing video games and surfing the Internet. Hulya also found that Generation Y prefers a high level of interactivity (both technological and personal) and prefers that the entertainment element at meetings and conferences is also emphasised. In addition, serious games as well as interactive learning tools such as touch screen tables with a high level of graphics can be utilised for this purpose. Specialised software tailored specifically according to a meeting’s needs will encourage collaboration: Generation Y generally prefers to collaborate and co-operate. If the right design is employed, this can help bring out Generation Y’s true potential as effective collaborators and motivate the achievement of objectives of the conferences and meetings as educational events. At the same time networking and motivation elements are satisfied. On the basis of her results Hulya advises conference organisers to understand Generation Y well and tailor their conferences and meetings accordingly. The findings have shown that there is no need for extreme changes. However, left to time, a gap will grow between the generations if attention isn’t paid to this issue now. Hulya’s research, and that of others, has shown that Generation Y is a very productive cohort, provided that it is approached the right way and given the right conditions.